Bandit Industries is proud to add a new safety option for hand-fed chippers called the Feed Wheel Engage system—a revolutionary device in the worldwide chipper marketplace. 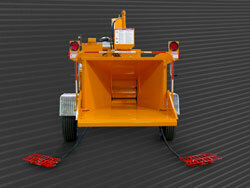 The system is operated by large foot pedals used to activate the chipper's feed system. These pedals are designed to keep operators clear of the infeed tray while still providing sufficient mobility to effectively feed the chipper. Should pressure on the pedals be released, the feed wheels instantly stop. "We've always been very proactive when it comes to chipper safety," said Bandit Industries Marketing Manager Jason Morey. "With the Feed Wheel Engage, no special action needs to take place to immediately stop the system. No bars need to be bumped, no emergency stops need to be pushed." The Feed Wheel Engage system is optional on all new Bandit hydraulic-feed brush chippers and available as a retrofit on older models. It is offered either as a pair of tethered pedals that can be placed accordingly for operator convenience, or with fixed pedals that extend down along either side of the machine. The Feed Wheel Engage overrides the forward command of the control bar; when either pedal is depressed the feed system functions normally for both advancing and reversing the feed. 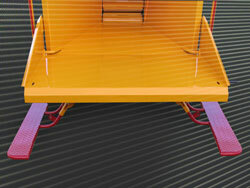 Without pressure on the pedal the feed system can still be reversed, but all forward motion is disabled. Acclimating to this unique system is exceptionally simple, and once operators are accustomed to feeding the equipment while using the pedals, production is virtually unaffected. The Feed Wheel Engage system is endorsed by leading Tree Care Industry experts and can help prevent operator injuries/fatalities when the chipper is improperly used, without compromising the production capability of work teams.